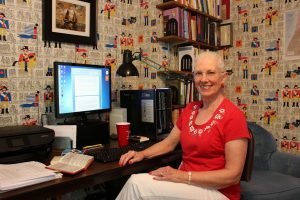 Lova Lantz, an avid reader since childhood, began to explore writing after retirement. For the 24 years of her marriage, in addition to raising three children, she was an informal editor for her husband, who was an educator. After his death at age 47, she discovered to her surprise that through her work with him she had acquired valuable editing skills—ones that would enable her to earn a living. For the next 20 years, she worked in various educational settings, often editing publications, curriculum guides, and programs of studies as part of her work. After several years of retirement, she began writing her own words in the form of memoir and discovered a new passion. Since 2015, she has self-published two books for her family and friends—one about 45 years of visits to a lovely coastal Michigan town that told a story in themselves, and one about her parents’ lives that included a chronology of family birth, marriage, and death dates from 1791 to the present. She is currently writing a third book about her husband and their life together. Once it was a little boy’s room, with its regimented rows of toy soldiers papered on the walls in primary colors. The little boy dreamed of airplanes, and hung them suspended from hooks on the ceiling of the room. That was during the years when the house held growing children, a husband, two Siamese cats, and a parakeet. In the first of the child-leaving-home shuffles, the room became my husband’s office. He furnished it with a library table, file cabinets, and a large cork board on the wall behind the table to hold his notes and schedules. Along another wall, there was a place for me—his de facto assistant and informal editor-in-chief. In the evenings, he produced the curriculum and policies, agendas and proposals required for his work, and I polished them. In that room with the soldiers on the walls. One by one, the children, the husband, the cats, and the parakeet all left their places, until the house was mine alone. All of these leavings occurred in the usual course of events, except for the husband, who died far too soon. Leaving his office to me. The one with the soldiers on the walls. After he was gone, sometimes it seemed I could still see him sitting there when I passed the room, at his table in a pool of lamplight, thinking and writing, dreaming dreams that would never be. He had always wanted to write—not curriculum and policies, but his own thoughts—later, when there would be more time. He had a folder full of ideas. Years passed. I put to use the editing skills that he and I had learned together, and I earned a living. I found I liked it, the editing—shaping ideas with words, rearranging sentences, clarifying thinking. Discerning what the writer meant to say, and saying it. More years passed, and I retired from earning a living. I traveled, tacking postcards of places I had been on the cork board behind the table in the room with the soldiers on the walls. In the file cabinets, folders of information labeled New England and Yellowstone and Texas, Paris and Australia and Israel, filled the drawers. And then one day I had a thought. I wondered what it would be like to write my own words instead of editing someone else’s. I took a two-evening writing class, and I wrote a one-page story. A year passed. I took a three-evening writing class, and I wrote a longer story, the one I had always wanted to tell about how my parents met, the one with the fortune teller and the unexpected train trip and the Miami pool room. And I discovered I liked writing too. Now I had a dream. I cleared one of the bookshelves in the corner and began to build a collection of books on writing. I tacked notes onto the cork board that said things like, “Stories live forever, but only if you tell them.” I pulled out my favorite picture of my husband and tacked that up there, too, just because. He smiled at me. I imagined him saying, Go for it! Bags of old letters to my mother and to my husband, stored in the basement for decades, moved into plastic lidded boxes that I stacked in the corner under the sunny office window, ready for reading. A wealth of stories to be told. I added files to the cabinet with folders labeled Story Ideas, and Writing by Others; Class Notes, and Stories in Progress, and then . . . Stories Completed. Over time, I added certificates to the cork board from writing classes at the folk school I’d discovered—six of them—in a row along the top. Two books with my name on the covers took their places on the shelf, self-printed, but still—books, with my name on them! Along the way, I discovered a purpose for the soldiers on the walls. On days when the writing didn’t flow, I sat at the computer with my fingers poised on the keyboard and engaged in an exercise I called “counting soldiers” until the words began to flow again. So now I sit at the computer in this transformed room, a place of contentment, and I write. My mind opens to ideas, images, and memories, and I lose track of the time, the day, even the season. Sunlight creates dappled shadows outside the window while I write about falling snow. Surrounded by writing riches, I loosen my tether to this place, setting my mind free to wander and to transfer words to my fingertips as if by magic. Writing is a surprise to me . . . because it came into my life at all, and because of what miraculously appears on the page. It reminds me that no matter what age we are, there are surprises. It reminds me that there is always room for dreaming. Maybe it helps to be in a room with soldiers on the walls. “Shaped by decades of editing, my approach to a piece of writing was to read the words for content and edit them into a coherent and understandable document. Hence my approach to my own early writing was similar: Write words, then edit them. My writing began with two brief continuing education classes, which led to a small writing group being formed by the instructor. The group met for four years. During that time, I read extensively about writing and embraced concepts such as “What is this story about?” and “Does this story ‘make a bagel’?” I also discovered the John C. Campbell Folk School and attended six writing classes there, expanding my knowledge and writing experience. During one of those visits, I spotted Maureen Ryan Griffin’s book Spinning Words into Gold in the craft shop and bought it. Later, when I took Maureen’s class at the folk school, the techniques in her book came vividly alive. The idea of deliberately crafting a story by priming my mind with words and using writing tools opened new vistas. Changing a writing piece from first to second person offered unforeseen possibilities for tenderness. Maureen caused me to see writing in a new light: Things happen to us. We see meaning in those things, and a story takes shape. We write it, and we fall a little bit in love with it, this piece of ourselves. But the power of the writing is that we tell the stories as no one else can. We choose the direction they will take. We decide how they will end. Because they are ours. Because we say so.